I spent one day of my vacation in California wine tasting in Los Olivos. I was also really excited that day because we did an olive oil tasting at a place called Global Gardens. I loved it so much that I decided to join their quarterly olive oil club… so four times a year I get a package in the mail containing 3 bottles of Global Gardens products. 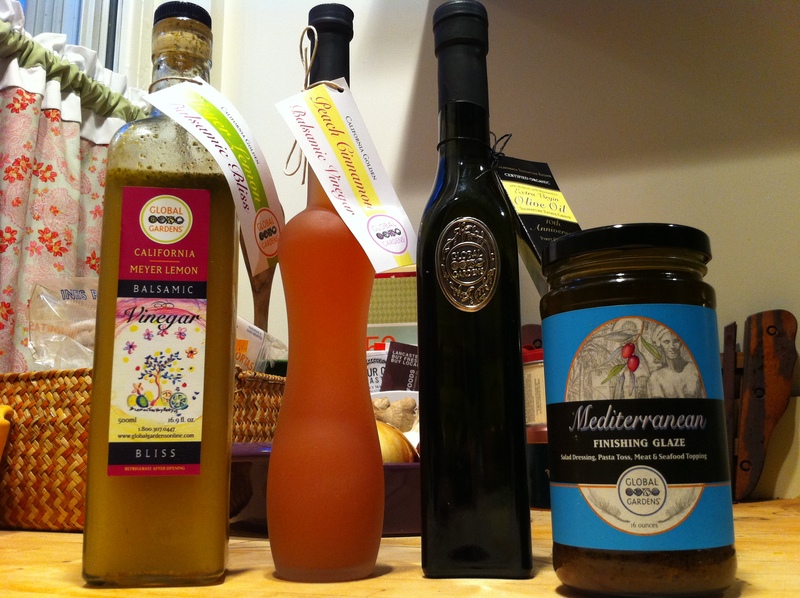 My next olive oil package is coming in November. I’m not sure what I am going to get next month but I hope it’s as good as the one I purchased in August. This one included Mediterranean Finishing Glaze, Peach Cinnamon Balsamic Vinegar, and 10th Anniversary Organic Extra Virgin Olive Oil. I added the Meyer Lemon balsamic Bliss to my package because I tried it at the shop and it was amazing on a piece of bread so I had to try it on some other food! I decided to share one of the recipes I made with the Meyer Lemon balsamic Bliss. Global Gardens has several fruit infused vinegars – some of which I got to try while I was in their tasting room – and all of them were outstanding! I have used the Meyer Lemon blend to marinate steak and several times as a salad dressing so far. 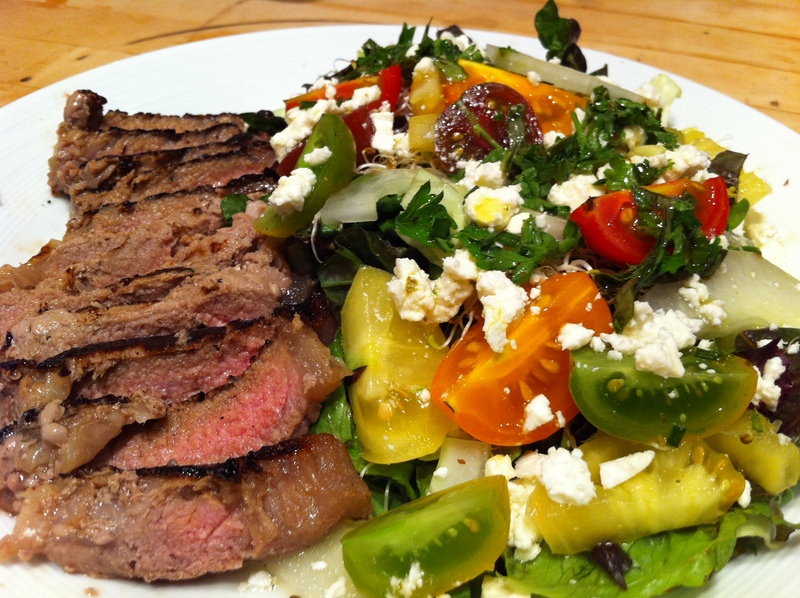 Here’s my sliced Bliss marinated steak with heirloom tomato and feta salad. I rubbed salt and pepper to two small steaks and placed them into a zip top bag. I added about 2 tbsp. of the Bliss vinegar and 2 tbsp. Extra Virgin olive oil. I’ll be honest… I can’t remember what cut of steak I used because I made this dish in August. I would recommend using a skirt or flank steak. They are some of my favorites to marinate. I let the steaks hang out in the refrigerator for most of the day. I grilled them over a medium high charcoal fire only for a few minutes until they were medium rare. If you use flank steak make sure you cut it at an angle against the grain so that it is tender, otherwise you’ll end up with some tough-to-chew pieces. I mixed spring mix and some home-grown romaine lettuce together with heirloom tomatoes cut into quarters, parsley, cucumber, and feta cheese. I used the Meyer Lemon Bliss for the dressing as well and drizzled the salad with extra virgin olive oil. The whole meal was a really nice light and bright summer dinner. The 10th Anniversary Extra Virgin Olive oil is a blend of organic Mission and Manzanilla olives. It is fruity and crisp and it finishes with a peppery flavor. It’s a great dipping oil for bread. It goes really well with aged balsamic vinegar. The Mediterranean Finishing Glaze makes a great bread dipping sauce. I’ve also had it over pasta and it was pretty good. I think it would be best used in a cold pasta salad if you are going to put it on pasta. It is the perfect accompaniment to a nice Antipasto appetizer plate. I do love finger foods, tapas, and snacking. If you are debating ordering something from Global Gardens, I would support you! It can get a little pricey, I would get some kind of package or gift set instead of buying individual items. I am trying it out for now because the Olive Oil Club is a pretty good deal. I really enjoy that they use good quality ingredients to make everything they sell. I definitely recommend a stop in Los Olivos and a stop at Global Gardens if you are going to California and you are going to be wine tasting.